The Audi driver has responded with his side of the story. Stomper Henry might have to fork out up to $30,000 for dental implants and surgery to fix his fractured teeth. A man fractured four of his teeth after allegedly getting punched in the face by his Grab driver during an argument over the cancellation of the trip at about 11.50am on May 12. Stomper Henry told Stomp that he and his family were heading to Choa Chu Kang from Block 727 Yishun Street 71 at the time of the incident. 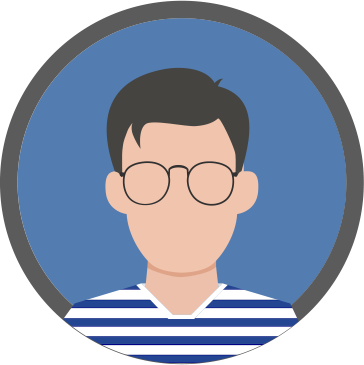 Henry booked a ride via the Grab app, and a driver of a black Audi had responded to his booking at about 11.33am. He did not indicate in his booking that he was travelling with two children. When the driver arrived at the block at 11.42am, he allegedly told Henry that he would not be able to pick the family up as Henry had a 5-year-old child with him and was supposed to have indicated that fact while booking the ride. He apparently advised Henry to book another ride. Henry said he agreed and the Audi driver went off. Henry then booked another ride using a different app, and the family waited for the ride at the same spot. While waiting for the second car to arrive, the Audi driver reportedly returned at 11.46pm. The driver allegedly started questioning him loudly, asking him why he had not cancelled his earlier Grab booking. Henry explained to the driver that he should have been the one to do the cancellation instead since he rejected the pickup. At the time, his second ride, a blue Mitsubishi arrived. 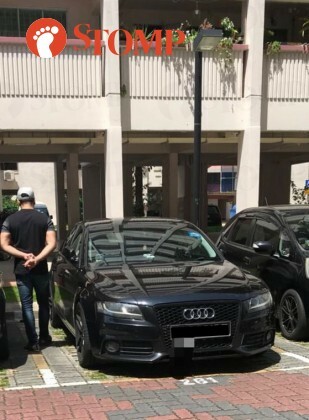 Henry said that the Audi driver started becoming verbally abusive, and shouted at him to cancel the booking while attempting to convince the Mitsubishi driver not to pick up Henry. Henry then agreed to cancel the Grab booking as he boarded the Mitsubishi, but still, the Audi driver was unhappy. At the time, Henry was seated in the front passenger seat, and he alleged that the Audi driver held the door open as he shouted at him, asking him to stop laughing even though he was not. Henry added that the Audi driver suddenly punched him in the face without warning as he was taking out his phone to cancel the Grab trip. The impact of the blow caused him to bleed profusely. Henry immediately called the police and asked his family to head back home as he was worried that the Audi driver might attack them as well. After that, the Audi driver apparently attempted to drive off, but Henry leaned on his vehicle to prevent him from leaving. The police and emergency services promptly arrived at the scene, and the Audi driver left after being questioned by the police officers. Henry was then conveyed to the accident and emergency facility at Khoo Teck Huat Hospital for treatment. 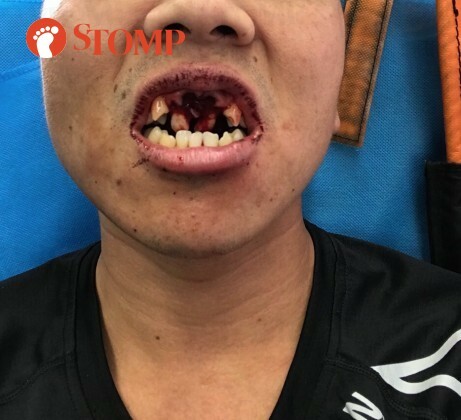 He told Stomp that he was referred for a dental checkup and surgery on May 14 after discovering that the blow had fractured four of his teeth. Said Henry: "I would like to highlight the severity of the incident. I was attacked without any provocation, and it was carried out in front of my wife and two young children. "The assault has caused serious mental trauma to me and my family. I feel a sense of helplessness for letting my children witness their father being attacked by a stranger. "Not to mention the effect this incident has on my children. What if they learn from to solve their problems through violent means?" A police spokesman said that they were alerted at 11.51am to a case of voluntarily causing hurt at Block 727 Yishun Street 71. A 35-year-old man was conscious when conveyed to Khoo Teck Puat Hospital and police investigations are ongoing. In response to a Stomp query, a Grab spokesman said: "The safety of our customers - drivers and passengers alike - is our absolute priority, and we do not tolerate such behaviour. "The police investigation is ongoing and we will be fully cooperating." Stomp understands that for safety reasons, all vehicles in Singapore must have booster seats or child restraints for passengers under 1.35m in height. Grab passengers who travelling with children can book GrabFamily rides that come with child booster seats for toddlers and seats for children between four to seven years of age. Man attacks Uber driver who cancelled trip -- while daughter watches and calls for "daddy"